Your morning cup of coffee may power you through your busy work day, but what if it could also power up your cell phone? 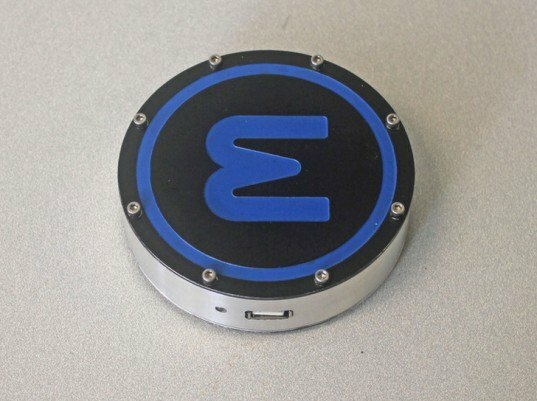 The Epiphany onEPuck is an incredible phone charger that siphons energy from your hot or cold drinks. The disk incorporates a Stirling engine that runs on heat disparities, transforming the change of your coffee’s temperature into power for your cell phone battery. Stirling engine systems are nothing new—they were first invented in 1816 as a rival to the steam engine. But with modern technology and materials, Epiphany was able to create a new thermodynamic system that can be used on your desk at the office. One side of the puck is marked with a red logo, which can receive hot beverages. 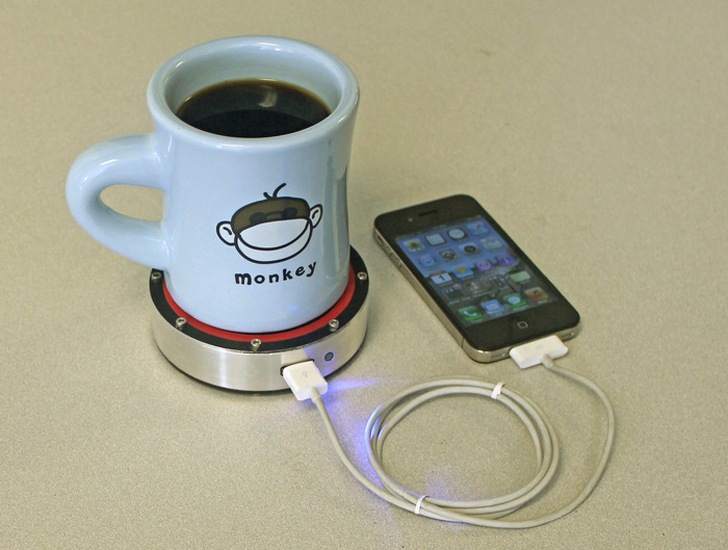 Coffee, soup or even candles can be placed on the puck (in a mug of course) and be connected to your phone to charge the battery. Cold drinks and ice can be placed on the blue side. As your hot drink cools down or the ice in your soda melts, the Stirling engine turbine begins turning, which generates electricity for the charger. A cup of coffee has enough power to fully charge your phone, just while you drink it. Even better, the onE Puck is a perfect back up if you forget your charger or no outlet is in site. Epiphany has launched a Kickstarter campaign to start production, so green energy (and coffee) enthusiasts can cash in before they hit retail prices. Sadly this company is full of false promises, I too was very excited about the possibilities of this device and even \\\'backed\\\' them $115 to their Kickstarter campaign. It was projected that they would be finished with building the device about a year after receiving funding. Well That was about two years ago and from the comments left by backers like me all show that none got their reward and the company has left no trail for means to contact them. Its a take the money and run agenda from what I\\\'ve experienced. Though I still think this device would be an amazing tool for a cool and clean way to charge up small devices, I just wish Epiphany was trust worthy. So we've had this technology for the last 200 years and the farthest we've taken it is a cellphone charger? How much does this unit cost and how can one buy one? Nice idea, but the numbers don't work out (as many in the kickstarter comments section point out). First year thermodynamics, and no amount of clever engineering will avoid the inevitable. Plus, if the cup is only weakly thermally connected to the puck, the efficiency is even worse. For example, a paper coffee cup, or a ceramic cup, maintains an insulating air gap on their bottom surfaces. Which will kill the transfer of energy from the liquid to the stirling engine.